As we know, salmon is a healthy choice—it is full of omega-3 fatty acids, is high in protein, and provides a full day's requirement of Vitamin D—and is a food we should try to eat more often. 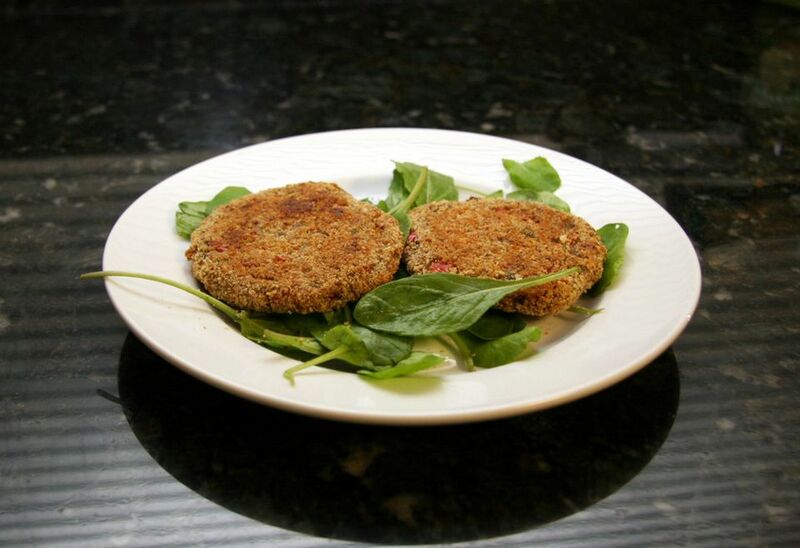 A nice change of pace from salmon fillet is a salmon patty, a crispy cake full of flavor. There are many recipes for salmon patties (also called cakes or croquettes); this version gets its flavor from diced onion and Italian seasoned breadcrumbs, which also contribute a bit of crunch; an egg helps bind the salmon mixture together. These patties can be served as is with a squeeze of lemon, drizzled with a sauce, or placed atop half of a roll as an open-faced sandwich. This is a very simple recipe for salmon patties that is perfect on a busy weeknight or when your pantry is wanting and you are due for a big trip to the supermarket. Remove skin and bones from salmon; flake and drain well. In mixing bowl, combine the salmon with egg, breadcrumbs, salt, pepper, and onion. Make into patties about 2 inches in diameter. Heat oil in a large skillet over medium heat. Fry the salmon patties for about 8 to 10 minutes, turning once to brown both sides. Sprinkle the salmon patties lightly with salt before serving. These salmon patties can be served in a variety of ways. Place atop a tossed salad or alongside a scoop of coleslaw for a filling lunch. Or make them part of a hearty meal and serve with scalloped potatoes or macaroni and cheese. English peas make a tasty side dish or serve them with your family's favorite vegetables. The crispy exterior is perfect served with lemon wedges or a cooling sauce, like a quick cucumber sauce. To make, combine 1/2 cup of sour cream with 1/2 to 3/4 cup of chopped cucumber, 1 teaspoon of cider vinegar, 1/2 teaspoon of dried dill weed, 1/4 teaspoon of salt, and a dash of onion powder. Replace the seasoned breadcrumbs with garlic- or Parmesan-flavored breadcrumbs. Add a few tablespoons of finely chopped celery to the salmon mixture along with the onion. Add approximately 1/2 to 1 teaspoon of dried dill weed and a dash of garlic powder along with the salt and pepper to contribute another layer of flavor to these crispy salmon cakes.